Join bestselling and award winning authors Matthew Quick and Meg Wolitzer in Raffles Makati and National Book Store’s Philippine Literary Festival from August 28 to 30, 2015 at the Raffles Makati Hotel. Admission is free! Attend three days of book signings, discussions and panels about books and literature from top Filipino writers and artists. The Meg Wolitzer talk and book signing will be on August 29 at 2 p.m. 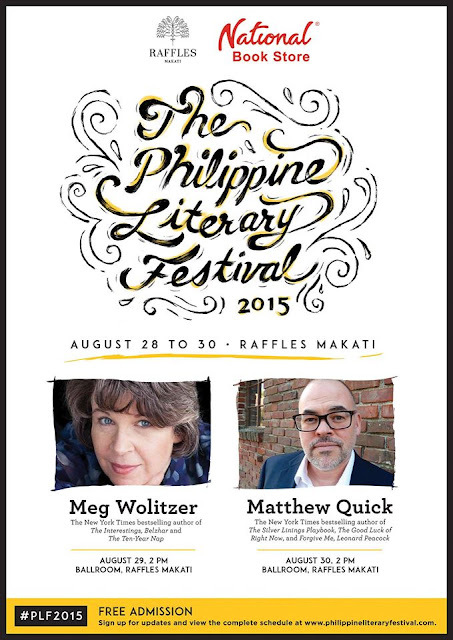 The Matthew Quick talk and book signing will be on August 30 at 2 p.m. View the complete schedule and get details of all events at www.philippineliteraryfestival.com. All events will be held at the Raffles Makati with registration starting at 9 a.m. everyday. Sign up for updates and view the complete schedule at philippineliteraryfestival.com. Tag #PLF2015 to join the discussion.